“Cloud” or “Cloud Computing” has remained a buzz in the technology space for the last decade or so. But for a layman, what exactly does it mean? How does it affect or benefit us or any organization for that matter? What is the future like when it comes to the cloud? Also most importantly is it really worth all the hype? Let’s try to look into and answer as many concepts as possible here. Every family needs milk at home. The quantity of the milk needed per family may vary but is more or less constant for each of the family every day or on an average in a week. Now there could be scenarios or situations where one might have some guests visiting or some festivals in which the milk consumption may rise. Also, there could be scenarios where the family goes for a vacation, or some members of the family are out of time due to any reason during which the milk consumption for those many days would decrease. What does the family do during such days of upward spikes or a drop in requirement? They simply buy less milk or ask the milk vendor to deliver only the required quantity for the specified duration. So, the question here is “Would you by the cow, for your intermittently fluctuating milk requirements?” The answer is No! Now just to explain, consider the cow being “the cloud” which instead of milk gives us “resources” to order in the right quantity based on our needs at the given period. Simple, isn’t it? So we don’t spend huge amounts of our money in the infrastructure (cow). We can pay as per the use for the resources (milk) quite literally ‘milking’ the benefits of the cloud (cow). What if I told you that all of us used the Cloud even before we knew about it? Yes, we do. Consider you have word file saved on your desktop at the office and you need to access that file at home for further modification. Can you really just open up your computer at home and start working on the file? No, because that would be saved on your office computer hard-drive and you would have to either email it to yourself so that you can download it home for use or you would have to carry it in some pen drive. Now consider you were working on the same word file on some third party platform such as the Google Docs in your G-Drive. All you had to do was have an internet connection at home and sign-in into the G-Drive using the same account! That’s it. Basically, you accessed the Google Cloud where they had saved your file on their server. Same happens when you access your emails. Be it Google, Yahoo or Microsoft emails; these are never on ‘a particular computer’ but on the cloud or server. This makes it possible for us to log into any machine and simply check emails by signing in with our username and password. Cloud was never an alien concept; it’s just that it is more commercialized now and smaller businesses and startups who aren’t financially strong to have the infrastructure are now moving ahead to reap its benefits. 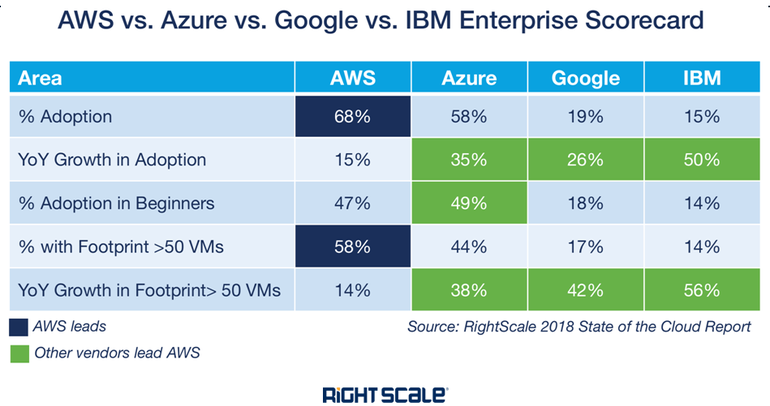 Now there are many organizations who have joined the ‘cloud party’ but the top contributors as per the latest 2018 survey are AWS (Amazon Web Services), Azure, Google & IBM. The following chart shows the market share of each of the player and how they compete with each other in terms of market adoption, Year on Year growth and footprints. Going further, there are various kinds of flavors in Cloud Computing that a business can choose to stick with. Depending on the need of the organization, a decision can be taken on whether an enterprise needs a Public, Private or Hybrid Cloud. Let’s briefly look at this in a bit detail. Public Cloud: This would be when an enterprise or business wants its resources to be available to everyone on the internet. The public cloud model allows users to utilize software that is hosted and managed by a third party and accessed through the internet, such as Google Drive. By allowing a third party to host and manage various aspects of computing, businesses can scale faster and save money on setup and management. Private Cloud: Private cloud infrastructure can be hosted in on-site data centers or by a third-party, but is managed by and accessible to the company alone. Companies can tailor private cloud infrastructure to meet the unique needs of the companies, specifically security and privacy needs. As opposed to the public cloud model, private clouds are not meant to be sold “as-a-service,” but is instead built and managed by each company, similar to a local or shared drive. Hybrid/Multi Cloud: This is just the combination of the private and public cloud. Here a company decided the nature of cloud services depending on resources and their access. Cost savings: The pay-as-you-go system also applies to the data storage space needed to service your stakeholders and clients. This means that you’ll get and pay for exactly as much space as you need. Security: For one thing, a cloud host’s full-time job is to carefully monitor security, which is significantly more efficient than a conventional in-house system. Because in the latter system, an organization must divide its efforts between a myriad of IT concerns, with security being only one of them. Flexibility: The cloud offers businesses more flexibility overall versus hosting on a local server. And, if you need extra bandwidth, a cloud-based service can meet that demand instantly, rather than undergoing a complex (and expensive) update to your IT infrastructure. This improved freedom and flexibility can make a significant difference to the overall efficiency of your organization. Mobility: Cloud computing allows mobile access to corporate data via smartphones and devices. This ensures everyone is updated considering over 2.6 billion smartphones being used globally today. Disaster recovery: Downtime in your services leads to lost productivity, revenue, and brand reputation. But while there may be no way for you to prevent or even anticipate the disasters that could potentially harm your organization, there is something you can do to help speed your recovery. Cloud-based services provide quick data recovery for all kinds of emergency scenarios from natural disasters to power outages. While 20 percent of cloud users claim disaster recovery in four hours or less, only 9 percent of non-cloud users could claim the same. Automatic software updates: For those who have a lot to get done, there isn’t anything more irritating than having to wait for a system update to be installed. Cloud-based applications automatically refresh and update themselves, instead of forcing an IT department to perform a manual organization-wide update. Competitive edge: While cloud computing is increasing in popularity, there are still those who prefer to keep everything local. That’s their choice, but doing so places them at a distinct disadvantage when competing with those who have the benefits of the cloud at their fingertips. Talking of my own experience with cloud first-hand, I have a habit of maintaining and updating my own notes on the tasks I am performing. At the very early stages of my working career, I often maintained notes over some word files or notepad. But as the problem goes with traditional storage, accessing these notes irrespective of place and time was a hinderance. Then I soon realized that Microsoft’s OneNote was quite a solution to this problem. My notes got synced with the Microsoft Account and were accessible to me everywhere and anywhere I needed them. Later on, there were other apps such as Evernote that were synced with my mobile phone and offered me greater flexibility and control over my notes and data. Providing cloud-based storage users may be a small update form a company’ viewpoint; however, from the user perspective, this is a very significant change. It can alter the way you work and makes ones’ life far easier. I am also quite an avid reader, and I have a Kindle to satisfy my need to read. I also have a Kindle app on my mobile phone. Now if it weren’t for the cloud, I would have to carry either my mobile phone or Kindle to every possible place to maintain and continue the reading. But the Amazon Cloud syncs the Kindle application on the phone as well as the Kindle to a level such that I can pick up reading from where I left on my phone from Kindle and vice-versa. Basically the cloud synchronizes whatever I read on either of the devices to make life easier for me. Moreover, I have drafted and worked over this article as and when I could find time in the office, home or even while my commute in the bus! How was this possible? Yes, cloud. I worked on the MSWord online, and I could jot down my points, expand on them, add or edit them as something interesting struck my mind. Cloud computing has been evolving the way businesses operate these days. Companies of all the shapes and sizes have been adapting to this new technology. Industry experts believe that cloud computing will continue to benefit the mid-sized and large companies in the coming few years. The Cloud is here to stay and the future is all “cloudy” (in a good way of course) with the growing needs and consumption of resources by Organizations and their clients. This is surely a way forward for also small businesses and individuals who also now need not worry about the price-overheads or infrastructure and just focus on the tasks. Also, it isn’t rocket science to understand that when businesses focus on the actual tasks to be performed rather than the overheads involved, they flourish.